Door Closer NW Fitting Service for your home, office or place of work? LET US HELP YOU, WITH OUR EXPERTISE. Our Engineers offer a Door Closer NW Service, to abide to fire regulations or for keeping your doors closed. Are you having problems with the front door of your shared home, flat or office door banging closed? This can be sorted out by fitting a hydraulic Closer, which will regulate the speed of your door closing, without banging closed. HMO regulations, also state that a self closer should be fitted in multi-tenement buildings. Here at North London Locksmiths Ltd. as well as supplying and fitting all types of locks as well as Door Fitting, we also supply and fit mechanical closers. At North London Locksmiths, our experienced fitters are here to undertake the work you require doing, such as, fitting of springs and closers. We fit all makes and models of door springs including BRITON, PERKO, UNION, DORMER, ECLIPSE, GIBRALTER, ASEC, GEZE, EUROSPEC. We will try and find any door spring or closer for you, to specification or to non specification. Our fully qualified Carpenters and Locksmiths are at your service to supply and fit Doors, Locks and Door Closers plus many other lock and door related items. Our Locksmiths and Carpenters will fit to your home office or commercial premises any closer which you require, whether it is specified by an architect or by building regulations. We fit all types from light domestic springs to heavy duty closers for industrial doors. As well as fitting them, we can supply them through our SHOP Base in North London, where you can purchase or have them fitted? As well as our springs and closers fitting experts, complementing this service, we offer a full LOCKSMITHING and CARPENTRY service, in the case of your frame being damaged through forced entry, or maybe a replacement or fitting of new doors. For the Number "ONE" Door Closer NW and Lock Fitting Company of London, Telephone the above number. 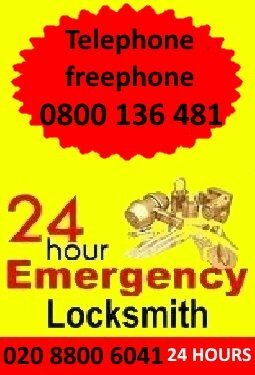 Our LOCKSMITHS are able to offer a 24/7 service to help you gain access to your Home, office or commercial premises. As well as our qualified CARPENTERS assisting you to repair your door frame, in the event of a burglary or other mishap. If you would like to know more about our company or what services we offer, please email our office through the link stating any enquiry you may have or telephone on the number below, to speak to a member of our staff, WE ARE NOT A CALL CENTRE. 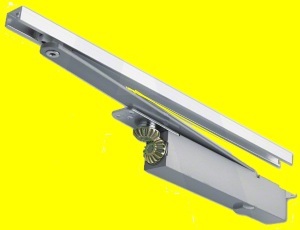 Mechanical Door Closers come in various designs, the most most common one being the one surfaced mounted on the back of doors, these come in various strengths depending on the size and weight of the door, the closer can be adjusted by both the door check speed and also the latch speed, they are ideal for wooden doors. Another type is the concealed overhead closer, this is a closer which is fitted into a pocket in the top of the door, the closer arm is fitted into the frame of the doorway, this is an ideal closer when discreet fixings are required. 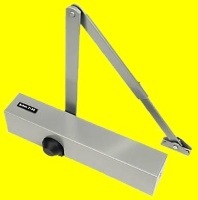 Other common type of Door Closers are the door closer which is fitted into the stile of the back of the door and fitted to the frame, this allows the door to close by a heavy spring unit, normally used on timber fire doors. 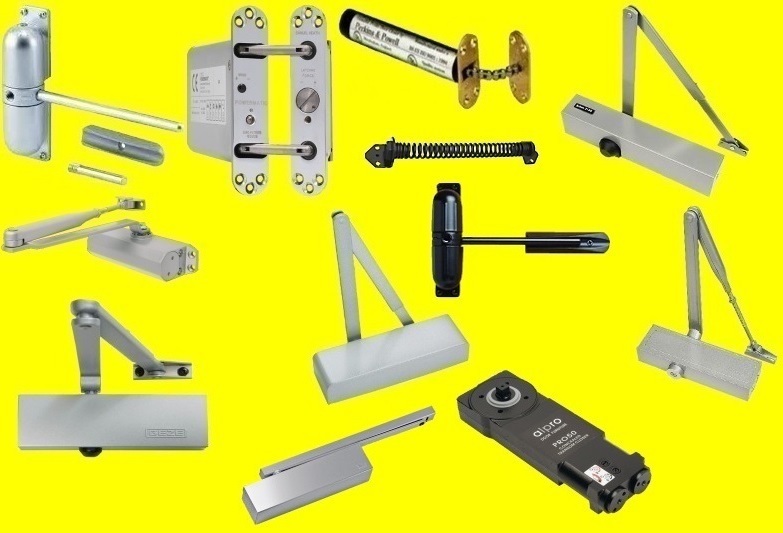 Many types of commercial and residential doors have closers as a part of their ironmongery. Public safety regulations and fire code often require the use of door closers, but closers are also used to ensure a door properly closes. Our qualified fitters will fit them for you. LOOKING AT THIS PAGE ON YOUR MOBILE AND WOULD LIKE TO CONTACT US? The Number "ONE" Door Closer NW Service in North and North West London. *Our day time charges for opening of lock are FAIR AND REASONABLE (in the North West London area). 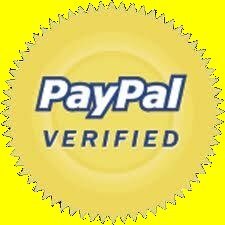 All you pay on top are for any parts at retail prices from our shop. Telephone 0208 800 6041 for our Door Closer NW fitting Service. The Number "ONE" Door Closer NW Fitting Service.